‘The Popover Experiment’ – Recipe No. 2. Popovers are a bit higher & insides are slightly drier. 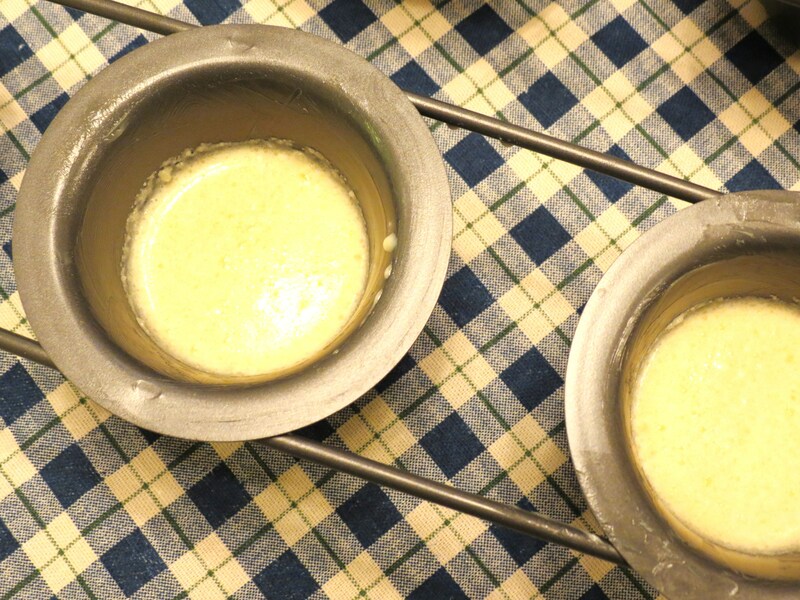 Julia Child’s Popover Recipe – with your choice of two different temperature settings, which result in two slightly different types of popovers! These particular popovers came out super high and crusty ’cause I actually left them in a bit too long at 425F – maybe 3 – 4 minutes too long ’cause I took some popovers over to a neighbor – and got back a bit too late.. No biggy – I just cooked them 3 – 4 minutes less at 350F. And, can you believe I did the same thing AGAIN while talking to a friend on the phone…. I re-set the timer but forgot to lower the oven temperature. The popovers were HUGE. Which just goes to show that popovers are actually ‘pretty forgiving’! 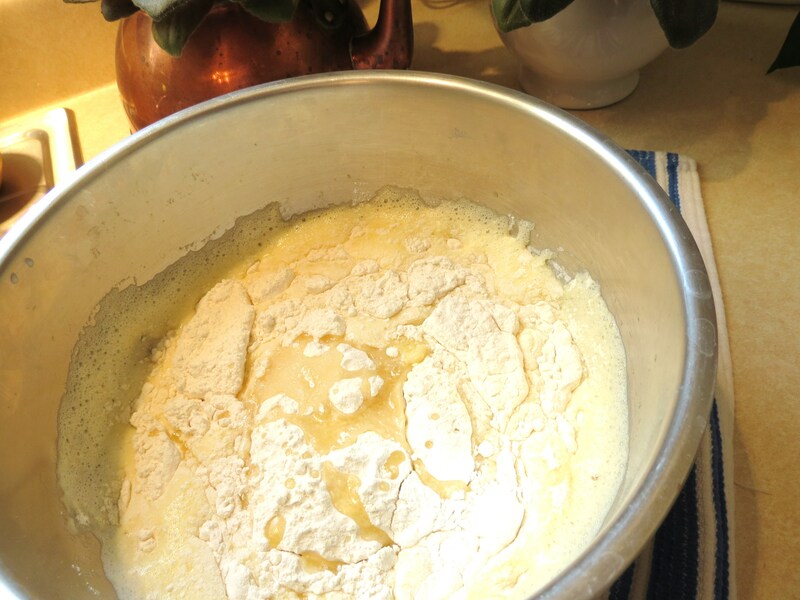 While working on ‘The Popover Experiment’, I tried two recipes attributed to Julia Child. The first recipe (from the book Baking with Julia) I found at vintagekitchen.com. It has the same list of ingredients as the recipe called Julia Child Popovers, found on Blogspot. The difference between the two recipes is the temperature at the end, when you lower the heat from 425F. Vintage Kitchen instructs lowering the heat to 350F, which results in a slightly bigger and slightly drier popover than the recipe from Blogspot. The Blogspot recipe recommends lowering the temperature to 325F. The resulting popovers are slightly smaller in size, with softer exteriors and creamy centers. These popovers tend to deflate more than the popovers cooked (at the end) at 350F, but that’s no biggy because they’ll probably be gone before they have time to cool and deflate. Tip !! If using older popover pans without nonstick coating, butter each section. Tip !! If using muffin tins or ramekins, butter each section. You’re going to have too much batter for a six-cup muffin pan, so use a 12-cup pan. Fill each section 1/3 full, and fill any empty sections with water. The popovers won’t be as big as those made in the new style popover pans but they’ll be wonderful. 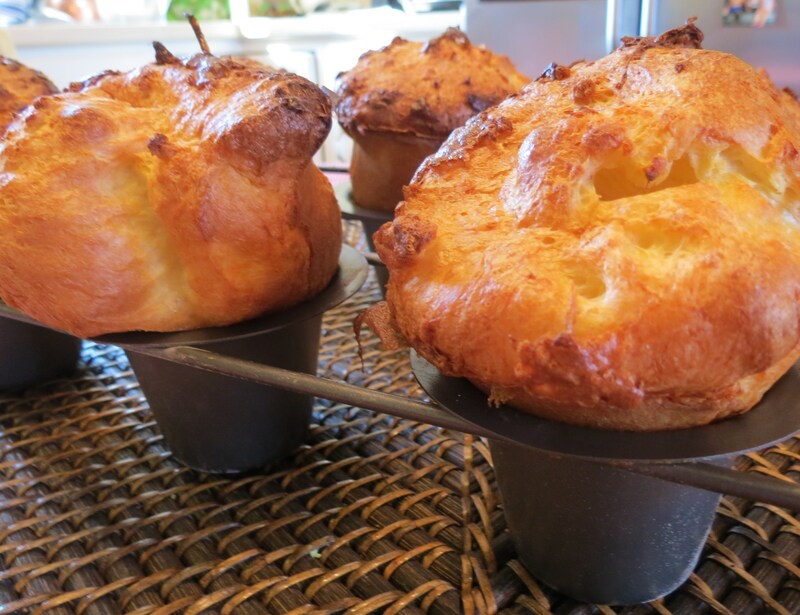 Yield – 6 popovers if using popover tin. 8 to 10 popovers if using ramekins/muffin tin. ++ For smaller, creaminer-in-the middle popovers, bake at 425F for 25 minutes, then lower heat to 325F for 15 – 20 minutes. ++ For larger, drier popovers, lower heat to 350F for 15 – 20 minutes. Your popovers are done when they’re puffed & lightly browned. I don’t know about you – but I think it’s rather magical how popover puff!! Recipes usually warn about opening the oven, but, if it’s at the very end, it won’t make any difference. Immediately after removing popovers from oven, pierce each with a sharp knife to release steam. Popovers are best served immediately. However, if you wish to save some for later, I recommend laying each popover on its side on a cooling rack until cooled, then covering each with plastic wrap. Enjoy !! I’m making popovers today and I found your post with Julia Child’s post. I’m looking forward to trying it. I’ve posted about popovers and link your blog to it today. You have a lovely blog here and I like its cheery ‘farmhouse’ ambiance. I grew up on a farm and have many fond memories of our little farmhouse. Hi Brenda – thanks so much for taking the time to comment. And thanks, as well, for linking this post on your blog!! I bet you do have lots and lots of memories growing up in a farmhouse. We didn’t buy either this house – or our farm in Quebec – until our twin sons were grown but they loved the farm in Quebec (which I sold several years ago) and this house Yellow Farmhouse – which we bought in 2004 after living in Europe for a time. Becky – you made my day!! I was so concerned that your popovers weren’t good… due to my ‘goof’! And I’m so happy you and your boys really, really like the recipe!! I, too, like the ‘crispier’ popovers! Thanks so much for taking the time to comment – as I said – you made me HAPPY !! Hi There – I’m soo sorry. I honestly think I’m going to have someone proofread my posts because I sometimes make mistakes…. even though I go over and over each post several times. I think, because I was making so many popovers for The Popover Experiment… I confused myself. The oven temp. SHOULD BE 425…. Again, I’m so sorry. Please let me know how your popovers came out!! Mistakes happen! The popovers came out great. Experimented with another online recipe after and my boys told me yours was better. Made them again this morning and they are even better than before (and I accidentally opened the door once while cleaning the stove)!! I used the bold print for the “crispier” popovers. Best popovers yet. I am done with popover-experimenting recipes. This one goes in the recipe box. Thank you. Hello, What is the recommended starting temp for the popovers? The top bold states 425, but below in the directions it has 450…I am in process of making and just panic’d! Thank you for your sweet compliment! Are you from Britain, as I noticed you say ‘profiteroles’, which I a word I’d never heard until I lived in Malta. I think we all have certain types of recipes that make us think… uh uh, maybe not… If you can make profiteroles, then you can – for sure – make popovers! I goofed up – more than once – while preparing popovers for my ‘experiment’ but they all came out well. Some I even liked more when I ‘goofed’ !! I’m going to post one more popover recipe – hopefully today – which result in large popovers with centers which are less creamy than Julia Child’s, but still have centers that aren’t as dry as some of the other recipes. I do believe that traveling opens up our minds to so many new and different experiences. I travel much less than I did when my husband was in international banking…. I miss it. I have to constantly remind myself to not distract myself while something is in the oven. I am so bad about it! Thank you Karen! I’m going to post one last recipe for my ‘The Popover Experiment’, but it’s not the one I had planned because I found yet ANOTHER recipe which yields a large popover with nice fluffy insides. It’s an adaption of a popover recipe which originated at Neiman-Marcus, which I found on fleurdeselsf.com. You’re so right John – these popovers turned out so well. I do, however, want to post one last recipe… if I can duplicate how I made it. The second time I prepared this recipe, I messed up. I failed to lower the heat from 450 F. to 350 F at the right time. But the popovers came out HUGE!! I know what’ll I’ll do. I’ll post the temperature/time change info. right here on my Recipe No. 2 page – since it’s the same recipe, just with slightly different cooking times and slightly different results. Thanks so much! I was at a party recently and someone I know told me, “I think you have too much time on your hands”….. meaning ‘The Popover Experiment’. I wasn’t offended – I consider my blog my “unpaid, fun part-time job”!! And it’s people like you who make having a blog so much fun! My aim for ‘The Popover Experiment’ was to take some of the ‘mystery’ out of popover making – and to show people how to prepare slightly different kinds of popovers. Thanks – aren’t you sweet ! !